The KSP Civil Police Constable Syllabus 2018 is released on @ www.rec18.ksp-online.in. 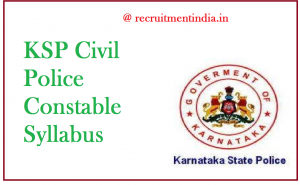 Applied candidates catch the Karnataka Civil Police Constable Exam Pattern in this page for the posts of 2113 Civil Police Constable. You should download this syllabus pdf and exam pattern through the official’s site or from this page also. The Karnataka Civil Police Constable Syllabus pdf is available here. As per the order of Karnataka State Police board, we placed the important syllabus and exam pattern in this page. Applicants, who have enrolled their names in this KSP Civil Police Constable Recruitment on before the due date, those postulants download the subject wise KSP Civil Police Constable Syllabus and refer the detailed exam pattern in this page. Contenders also refer the Latest Karnataka Jobs in this page. ಕರ್ನಾಟಕ ರಾಜ್ಯ ಪೊಲೀಸ್ ಮಂಡಳಿಯು ಕೆಎಸ್ಪಿ ಸಿವಿಲ್ ಪೋಲಿಸ್ ಕಾನ್ಸ್ಟೇಬಲ್ ಸಿಲಿಬಸ್ 2018 ಅನ್ನು ತಮ್ಮ ಅಧಿಕೃತ ಸೈಟ್ನಲ್ಲಿ ಪರೀಕ್ಷೆಯ ಮಾದರಿಯನ್ನು ಪ್ರಕಟಿಸಿತು. ಅಪ್ಲೈಡ್ ಅಭ್ಯರ್ಥಿಗಳು ಸಿದ್ಧತೆ ಉದ್ದೇಶಕ್ಕಾಗಿ ಸಾಧ್ಯವಾದಷ್ಟು ಬೇಗ ಡೌನ್ಲೋಡ್ ಮಾಡಬೇಕು. If you want to download the KSP Civil Police Constable Syllabus, refer to this page. Because in this page, you can catch the syllabus and exam pattern in pdf format. Contenders, who have submitted their registration forms on before the due date, only those are the eligible candidates to take the KCP Civil Police Exam. So apply for these posts as soon as possible on before the last date of 30 June 2018 and you have a chance to submit the application fee on 03 July 2018. Whenever apply it, check out the link to save the Karnataka State Civil Police Constable Syllabus. Dear aspirants, a high number of vacancies are issued by the board, So the competition is also heavy. Certainly follow the Karnataka Civil Police Constable Syllabus, that is the better way to reach the highest marks in the exam level. In the early times only, the eligible participants downloaded the KSP Syllabus and start their preparation in their own way with perfect planning. Contenders to get the latest employment news information refer our web page @ www.recruitmentindia.in regularly. If you once observe this page, you can catch the Karnataka Civil Police Constable Exam Pattern in brief explanation. In this test pattern, we mention the exam type, subject wise topics, and subtopics, marks, duration of the exam etc. In this written test consists of only three topics: English, Kannada, General Studies. So participants use this KSP Civil Police Constable Syllabus downloaded links and use this syllabus in the preparation time for gaining the high score. Are you searching for the free download of Karnataka Civil Police Constable Syllabus 2018? . Then this page is here to give the KSP Constable Syllabus Free Download Links. Once check this page for knowing all the information about the syllabus and exam pattern. In this page, our site provides the relevant syllabus for the applicant’s convenience. Candidates if you feel confusion in the KSP Civil Police Constable Syllabus saving process, implement the below given syllabus downloading steps in this page. Applicants also refer the Previous Papers in this page. On the opened home page, find the KSP Civil Police Constable Syllabus 2018 notice. Then check all the syllabus are present in subject wise or not.